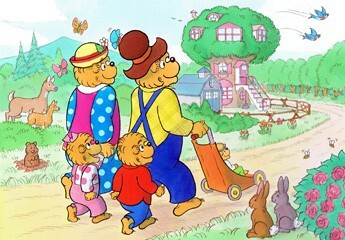 The first Berenstain Bears book was The Big Honey Hunt, published in 1962. It was part of the Beginner Books series, a new division of Random House. Its trademark was “I can read it all by myself,” and its president and editor-in-chief was Theodor (Ted) Seuss Geisel, otherwise known as Dr. Seuss. So we were off to the races. We were all set to do a series of books about our crazy bears who lived down a sunny dirt road deep in Bear Country. A few weeks after Honey Hunt went into production, Ted called. He and Helen (his wife, Helen Palmer) were coming east. He invited us to lunch. We would celebrate the publication of Honey Hunt and perhaps discuss what our next book might be. Stan hung up the phone and we looked at each other. It had been a tough fight, but we had won. We met Ted and Helen at Random House and walked over to the Park Lane Hotel, where we would be having lunch. Lunch was posh, pleasant, and relaxed. With dessert on the way, Ted said, “Well, Berenstains, what do you have in mind for your next book?” What we had in mind, of course, was the next book in a series about our bears. Hey, maybe Ted was right. Maybe there were too many books about bears. Ted had been around a lot longer than we had. 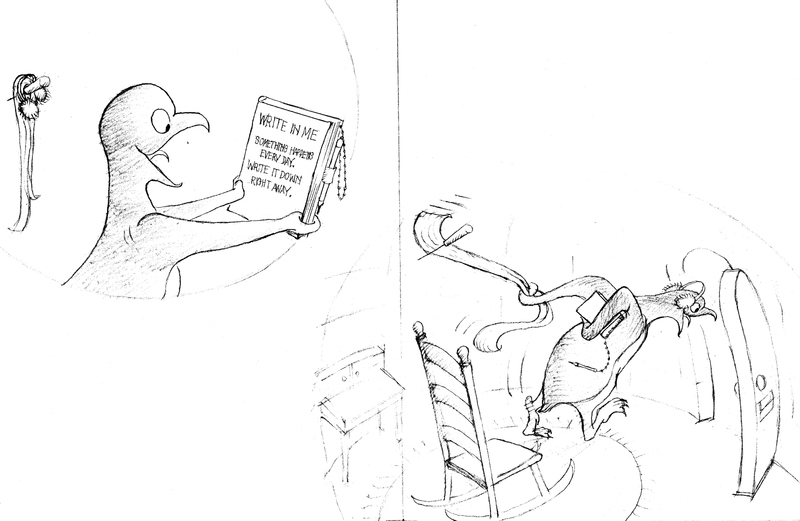 There certainly weren’t too many books about penguins. As far as we knew, there weren’t any. We’d have the whole penguin market to ourselves. We’d think further about it in the morning. We awoke the next morning with a sense of loss. We’d had our hearts set on a bear series. We had worked so hard getting to know our bears, cultivating them, bringing them into being. But we proposed and Ted disposed. And there wasn’t a thing we could do about it. It took us a while to get over our disappointment, but we did. We began thinking about penguins. We began noodling around with a penguin character. We handed penguin sketches back and forth. A character began to appear. He was a cute little guy. He wore a little wool hat and a long red scarf and lived in an igloo. But we needed a story. The South Pole environment wasn’t exactly teeming with story possibilities. 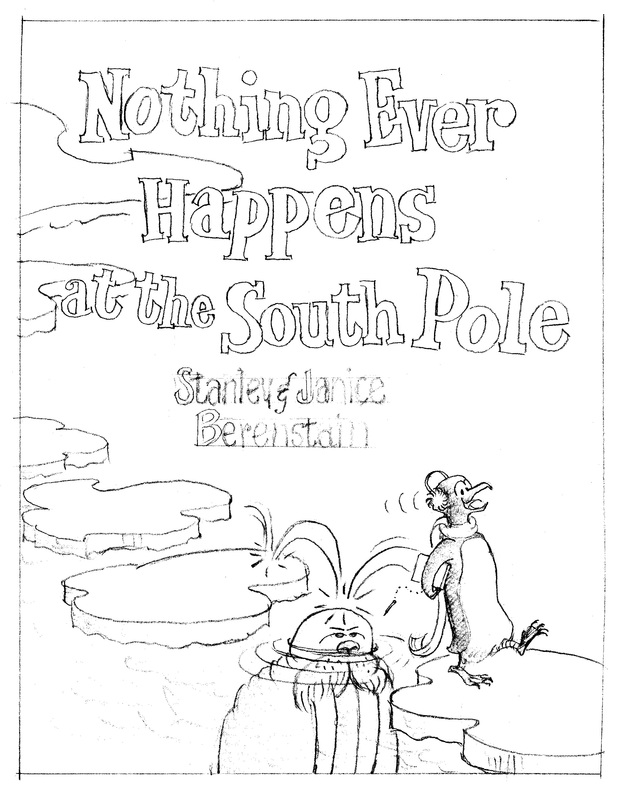 Nothing much happened at the South Pole. Maybe that was the key to our story―though “nothing happening” was hardly a promising idea. But we thought of something that offered the glimmer of a story. What we had in mind for our little igloo-dwelling penguin was a polar walkabout. But how to motivate such a walkabout. We hit on the idea of a diary―the kind with lock and key and a pencil on a string. One morning, just such a diary arrives in the igloo (we figured a diary arriving out of nowhere was covered by cartoonist license). Our penguin opens the diary. The first page says, “Walk around the South Pole and write down what happens every day!” Our penguin dutifully embarks on his polar walk, pencil at the ready. Things happen―cataclysmic things: icebergs thrust up through the ice cap, polar bears attack giant walruses, killer whales attack polar bears. But they all happen behind our penguin, just after he has passed. So he is completely oblivious of them. (We gave him earmuffs so he wouldn’t hear the racket.) He walks all day. He returns to his igloo, opens his diary, and writes, “Nothing ever happens at the South Pole.” End of story. 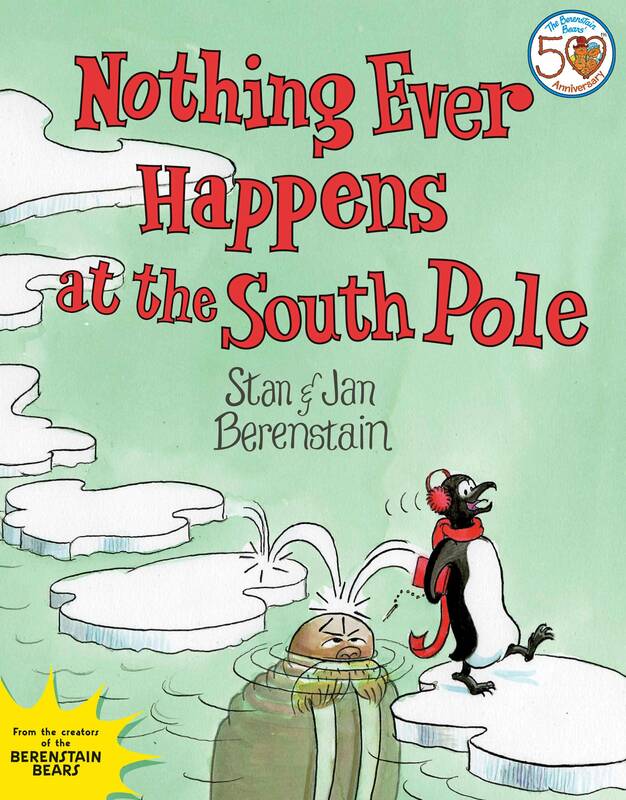 That’s what we called it: Nothing Ever Happens at the South Pole. We did our penguin book up brown, or to be precisely accurate, we did it up red and blue. 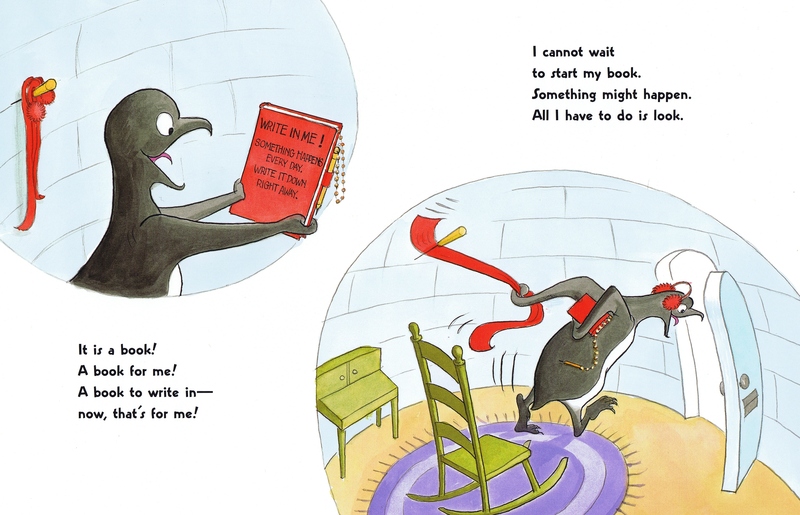 Our penguin book not only would be different from Honey Hunt, it would look different. We did the whole thing with one of those blue-at-one-end, red-at-the-other-end pencils that came with kids’ pencil cases. Our penguin’s hat and scarf and the cover of his diary were red. Everything else in the book was icy blue. We knew when Ted and Helen would be coming east again. We called, and without giving away what the book was about, arranged for a meeting to present it to Ted and company. The atmosphere in Ted’s office was as cordial as ever, but strangely subdued. “Well,” said Ted, “let’s have a look.” He sat at a desk up near the front of the office. Helen and Phyllis (Phyllis was Bennett Cerf’s wife; Bennett was chairman and co-founder of Random House) weren’t crowding around as they usually did. We placed the dummy on the desk and hovered nervously as Ted proceeded to go through it. “Nothing Ever Happens at the South Pole,” he intoned. “Helluva title … hmm … about a damn penguin … cute little bugger. Good idea―the business with the diary. Wonderful drawing. It’s really quite beautiful …” But he was only about halfway through it when he looked up. “Berenstains, let me run something past you. An interesting thing has happened. The salesmen have The Big Honey Hunt out on the road. And it’s going over big. The buyers love it. We’ve already upped the first printing. So let me ask you. What would you think about doing another bear book next? There’s no reason why there couldn’t be a whole bear series.” The offices were quiet and still. Dust motes sparkled in the sun rays streaming in the high windows. “But I like this penguin book a lot. We’ll just put it on the back burner,” he added. “Sure, we’re game,” said Stan. Ted beamed. He stood up and grasped Stan’s hand. Then he gave Jan a big hug. Helen was grinning. Phyllis was bringing a tray of coffee. There were cookies. as someone who fell in love with the berenstain bears as a child and now as a mama of a daughter who loves them just as much, i love reading the behind the scenes stories. thanks so much for sharing! Thank you, Melanie! We are SO delighted Jan actually found this and was able to ink and paint it before she died in February. She saw the printed cover, but not the printed book. It is indeed very special to all of us!